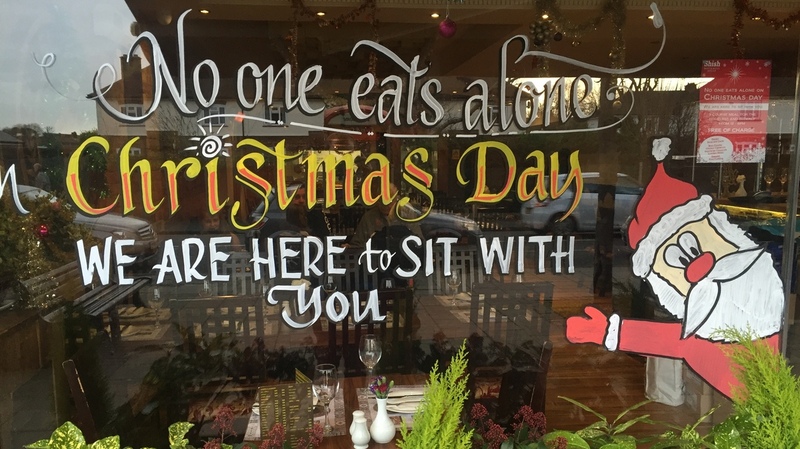 'No One Eats Alone On Christmas': Restaurant Serves Free Meals To Homeless, Elderly The Muslim-owned restaurant is expecting hundreds to attend their free, three-course meal on Christmas day. After Shish's handwritten sign erupted on social media, the restaurant painted a sign on the window to announce the event. Most restaurants close their doors for Christmas day, but one is leaving their's wide open: Shish Restaurant in southeast London. On Dec. 25, they will be serving free, three-course meals to the homeless and elderly. The idea came after an emotional encounter between two of the managers and an elderly woman. "What she said was, 'On Christmas day, I'm going to be alone,' " Manager Irfan Can Genc tells NPR's Allison Aubrey. "When [the other manager] told me about this I was like, 'Look, we need to sit down. No one should be alone on a special day like this.' "
So they took a piece of paper and wrote a simple sign saying, "No one eats alone on a Christmas Day! We are here to sit with you." They shared it on social media, and it soon went viral. "We just think it's really great that they're giving up all that money that they could get in tomorrow and giving it to somebody else," says Anne O'Reilly while eating Shish with her family on Christmas Eve. "That's just so unusual in this day and age for anybody to do something like that." "A lot around here wouldn't do it," says Clive O'Reilly, Anne's husband. "It takes people like this to do it. Perhaps next year, people might follow along." At first, Genc says they were planning on 40 to 50 people attending. "Our aim was to get the local people together on a special day," Genc says. Since the social media surge, they expect hundreds. After struggling with the Syrian refugee crisis and voting to leave the European Union, Genc says the dinner is a way to build bridges between the Muslim community and the city of London. "We're here to say that we're not bad people," Genc says. "Christmas is a special day. It says in the Quran that it is a special day. Everyone's going to be with their families, eating loads of food, drinking, having lots of fun. Why should other certain people be left out?" With the help of thousands of shares on social media and donations from around the globe, the hope is there won't be. BBC reporter Dan Hudson contributed to this report.